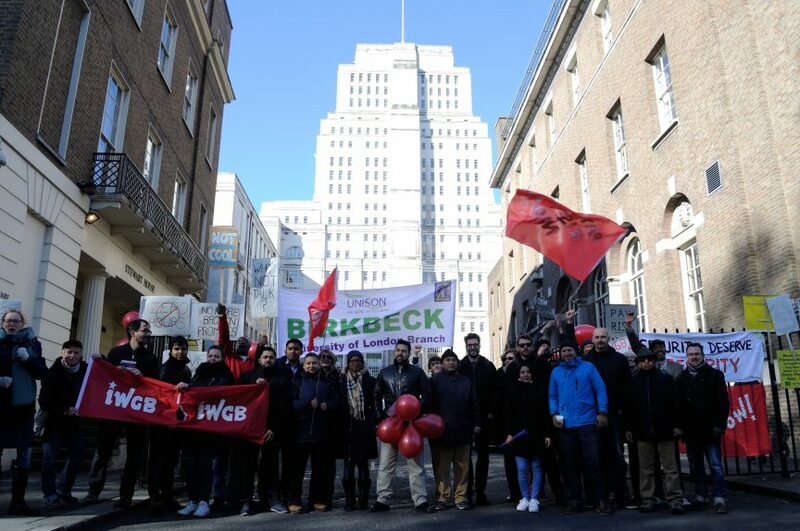 “Some were scared, scared to lose their jobs” security officer (SO) and Independent Workers Union of Great Britain (IWGB) activist, Abdul Bakhsh explained from the picket line of yesterday’s strike, called by SOs at the University of London (UoL). Bakhsh was referring to the events of 2012 and 2013, when subcontracted workers at the UoL launched a 30 month campaign for improved working conditions. Culminating in a two-day strike, the campaign won major concessions, including a living wage, equal holidays and sick pay and pensions for all subcontractor-employed staff at the UoL. Back then, some SOs were actively policing the strike. Now, with a 100% “yes” to strike action through the IWGB union, the same group of SOs are striking themselves, demanding higher wages, an end to zero-hours contracts and proper pay slips. In 2012, UoL management promised to introduce the London Living Wage (LLW) and to maintain then-current pay differentials across the workforce. However, with the inflation-related LLW increasing each year, and management’s promise of maintenance not upheld, SOs are owed a 25% pay rise. Hence, a two-day strike took place this Tuesday and Wednesday; the first SO strike in UoL history. “Private security” is an umbrella term that describes everyone from mercenaries to people that carry out deportations to receptionists who largely help with directions and disabled access. Increasingly, however, parts of the private security industry are performing police-like roles. Most oppositional events – strikes, demonstrations, riots, etc. – are, in some capacity, acted against by SOs. Which begs the question: are they all “privates in private armies“? And if so, why should the left support them? Unlike the police, however, the majority of SOs are badly paid and enjoy none of the benefits of cops or soldiers (job security, pensions, etc. ), and for this reason, they are far less dependably repressive than the police or military. We shouldn’t forget that future SO strikes, like all strikes and disruptions, will be met with working SOs, or “scabs”– people working in place of those on strike, thus weakening its effect – who are expected to collaborate with the police as part of their job. The SOs on strike this week recognise that this is what some of them did in 2012 and 2013. Through its activity since 2012, UoL SOs have worked through the IWGB to convince their colleagues that strikes are not threats but demands for solidarity; it worked. This time, SOs were supported by cleaners, who can expect the same show of solidarity when they strike. The word “scab” needs, like any curse word, to be used with some restraint. But many would argue it does need to be used. Is it the right name for the workers brought in as replacement for this week’s strike? IWGB General Secretary Jason Moyers-Lee’s thought so: “Yeah, why not, it’s the definition of it”. But what pressures led to scabbing in this instance, and what do they tell us about this work? Three security guards working during this week’s strike explained that their role is to “float” – to move from workplace to workplace. They were told last Monday that they were needed at the UoL. As usual, they were not told why they were needed. On arriving, they were informed by management that the striking workers were “offered a deal”, which they had refused. This outright lie was the first they had heard of the strike, or of the IWGB. Scabbing is a question of consciousness and, in this case, of basic information. Simply put, the workers didn’t know what they were doing until after they started doing it. What’s more, there’s also the question of contracts and money. Zero-hours contracts are a means of disciplining workers; not taking a shift for whatever reason – too far, too soon, too much like scabbing – results in workers’ receiving a “refusal” note by their names – and any victimising of labour activists is hard to prove. 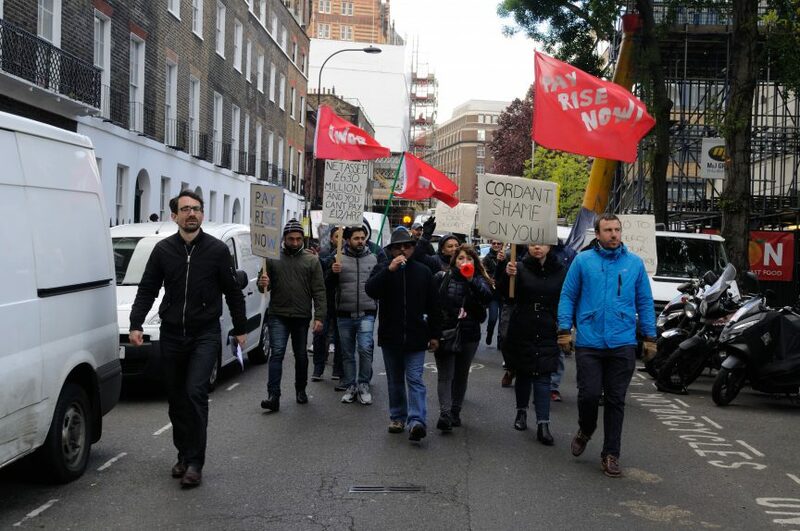 As Bakhsh said of those SOs working today, ‘I am not against them, I am against [contractor] Cordant … we have to stop the zero hour contracts’. But, some SOs weren’t naively working during the strike; they were unashamed scabs, providing muscle in the way of organised labour. The fact that several of them appeared to be unlicenced – a requirement of both the employers of SOs and the hired individual since the 2001 Private Security Industry Act – is, according to Moyers-Lee, ‘a pretty serious thing’. By one striking worker’s account, “managers sen[t] all the people that looked like they didn’t have a licence inside.” If this is indeed the case that unlicenced people were working as SOs, then the extremely heavy-handed efforts by one working SO against a striker will be especially embarrassing for Cordant. Despite management’s lies, eyes-wide-open scabs, and possible law-breaking violence, the strike was disruptive and, maybe even more importantly, made those SOs who had naively come to work aware that there is now a militant union through which to work against their employers. In every year since 1991 the number of strikes has been lower than the number of strikes in any year prior to 1991. The Tories’ 2016 Trade Union Act , with the draconian demands it puts on unions, will only exacerbate this trend. But, unions like United Voices of the World and IWGB – democratic organisations, primarily representing People of Colour and migrants, in sectors with historically low levels of unionisation – are able, through strikes and protests, to not only to take offensive actions, but win them. That IWGB SOs yesterday decided by unanimous vote to strike again, for three days next time, comes as little surprise. Why the more established unions have not been able to sustain the kind of opposition that the IWGB and UVW have is a pressing question for the labour movement and for the left. In answering it, we cannot forget that Unite members at Fawley, or Unison teaching-assistants in County Durham, were able to act together against capital, albeit without the full support of – and even sometimes, in opposition to – sections of their union bureaucracies. Democratic, member-led trade-unionism can turn anti-strike SOs into labour activists. One scab at a time, unions like IWGB are showing how workplace power is built. It is therefore vital we support them both financially, and practically.